Super Soul Sunday: Advice on living a happy life. Good advice for a successful day & a happy life. Especially for us English professor/writer-types and creative people of all kinds. We need poetry, and song, and art, and connection, in all its forms. It’s good for the soul. It’s even better for fostering creativity. I try to incorporate a little of each every day. How about you? 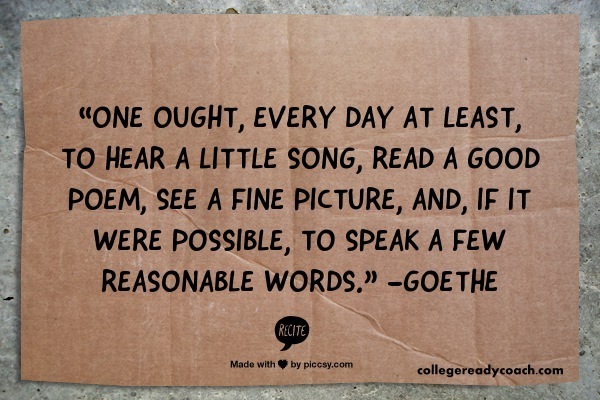 Make sure to take that little bit of time out to do some part of Goethe’s recipe for living a happy life. Categories: College, Education, Happiness, Quotes, Uncategorized, Writing | Tags: advice, art, classroom, college ready, create, creativity, education, Goethe, happiness, happy teacher, higher ed, how to be a writer, love, music, namaste, Peace, poetry, quotes, teaching, writing, zen | Permalink.